Solomon "Sol" LeWitt (September 9, 1928–April 8, 2007) was an American artist regarded as a pioneer in both the Conceptual and Minimalist Art movements. LeWitt stated that ideas, not physical creations, are the substance of art. He developed instructions for wall drawings that are still being created to this day. Notable Quote: "The idea becomes the machine that makes the art." Born in Hartford, Connecticut, Sol LeWitt grew up in a family of Russian Jewish immigrants. His father died when Sol was only six years old. 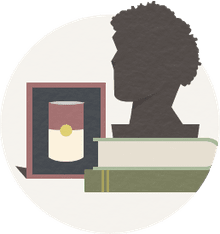 With encouragement from his mother, he attended art classes at the Wadsworth Atheneum in Hartford, Connecticut. LeWitt showed a talent for creating humorous drawings. Most children in LeWitt's neighborhood took industrial jobs, but he pursued art to rebel against expectations. Although he wanted to skip college, Sol compromised with his mother and attended Syracuse University. While in college, he won a $1,000 award for his work creating lithographs. The grant helped fund a trip to Europe in 1949 where LeWitt studied the work of the Old Masters. Drafted into the United States Army during the Korean War in 1951, Sol LeWitt served in the Special Services and created posters among other duties. He visited many shrines and temples in both Korea and Japan. LeWitt returned to New York in 1953, set up his first art studio, and began working as a design intern at Seventeen magazine. He also attended classes at the School of Visual Arts in Manhattan. LeWitt joined I.M. Pei's architectural firm in 1955 as a graphic designer. There he began developing his idea that art is a concept or a blueprint for creation, and not necessarily the finished work—meaning that the physical work could be executed by someone other than the artist. After taking an entry-level job as a clerk at the Museum of Modern Art in New York in 1960, Sol LeWitt had firsthand exposure to the landmark 1960 exhibit Sixteen Americans. Among the featured artists were Jasper Johns, Robert Rauschenberg, and Frank Stella. Showing independence from the tradition of sculpture in the arts, LeWitt called his three-dimensional works "Structures." Initially, he created closed wooden objects lacquered by hand. However, in the mid-1960s, he decided it was necessary to reveal the internal structure leaving only a skeletal form. In 1969, LeWitt began creating his structures on a large scale often constructed out of fabricated aluminum or steel. In the 1980s, LeWitt began creating large public structures out of stacked cinder blocks. He started working with concrete in 1985 creating the cement "Cube" for a park in Basel, Switzerland. Beginning in 1990, he created multiple variations on a tower of concrete blocks for locations around the world. One of LeWitt's final structures was the 2007 design for "9 Towers" to be constructed in Sweden out of over 1,000 light-colored bricks. 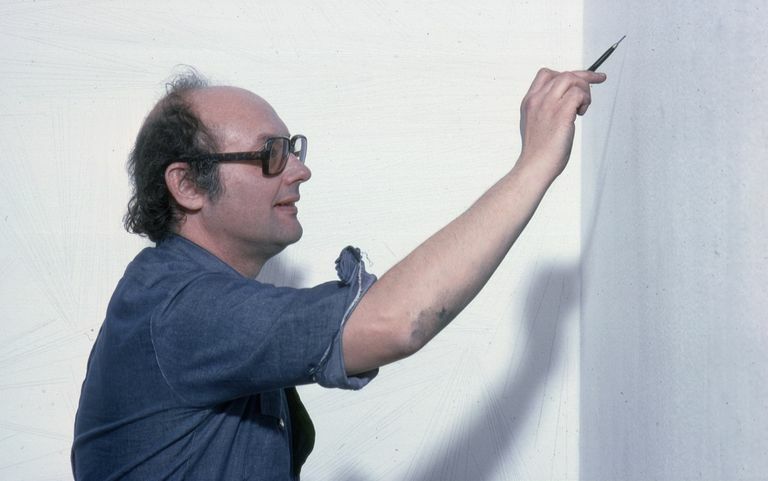 In 1968, LeWitt began developing guidelines and diagrams for making works of art by drawing directly on the wall. At first, they used a graphite pencil, then crayon, colored pencil, and later India ink, acrylic paint, and other materials. Many of LeWitt's wall drawings were executed by other people using his guidelines. LeWitt stated that the wall drawings are never the same, as everyone understands the instructions differently and draws lines uniquely. Even after his death, LeWitt wall drawings are still being produced. Many are created for exhibitions and destroyed once the exhibition is over. A characteristic example of LeWitt's wall drawing instructions is as follows: "Draw all combinations of two lines crossing, placed at random, using arcs from corners and sides, straight, not straight, and broken lines." This example comes from "Wall Drawing #122," executed at the Massachusetts Institute of Technology in Cambridge, Massachusetts. After moving to Spoleto, Italy in the late 1970s, LeWitt began creating wall drawings with crayon and other brightly colored materials. He credited the change to his exposure to Italian frescoes. In 2005, LeWitt began developing a series of scribbled wall drawings. As with his other works, the instructions for creation are highly specific. The scribbles are done with six different densities that ultimately imply a three-dimensional work. New York's John Daniels gallery mounted Sol LeWitt's first solo show in 1965. In 1966, he took part in the Primary Structures exhibition at the Jewish Museum of New York. It was a defining event for Minimalist Art. The Museum of Modern Art in New York launched a Sol LeWitt retrospective in 1978. Many art critics embraced LeWitt for the first time following the exhibition. The 1992 Sol LeWitt Drawings 1958-1992 exhibit began at Gemeentemuseum in The Hague Netherlands before traveling to museums around the world for the next three years. A major LeWitt retrospective by the San Francisco Musem of Modern Art in 2000 traveled to Chicago and New York. A massive exhibition titled Sol LeWitt: A Wall Drawing Retrospective—a collaborative project of Yale University, the Massachusetts Museum of Contemporary Art, and Williams College—opened in 2008, a year after the artist's death. It includes almost an acre of wall space devoted to more than 105 drawings created to LeWitt's specifications. Sixty-five artists and students executed the works. Housed in a 27,000-square-foot historic mill building, the exhibition will remain open for viewing for 25 years. LeWitt's methods of using lines, shapes, blocks, and other simple elements made him a key figure in Minimalist Art. However, his primary legacy is his vital role in the development of Conceptual Art. He believed that concepts and ideas are the substance of art, not the final piece that is created. He also insisted that art is not about anything in particular. These ideas distinguished LeWitt from the romantic and emotional work of the abstract expressionists. LeWitt's 1967 essay "Paragraphs on Conceptual Art," published in ArtForum, is a defining statement for the movement; in it, he wrote, "The idea becomes the machine that makes the art." Cross, Susan, and Denise Markonish. Sol LeWitt: 100 Views. Yale University Press, 2009.